I began the Spring Pre-Running Diet. I will fist fight for: pizza, cheese, spicy tuna sushi rolls, cheeseburgers, fried anything, milkshakes, ice cream, pie, waffles, or cake. I will also, at the minimum, wrestle for pancakes, steak, eggs with actual cheese, a bucket of ketchup, mayo on a shoe, bread, cookies, hash browns, sausage, any kind of casserole, tacos, fish sandwiches (species irrelevant) and any animal that has ever lived in the ocean with the exception of a walrus, and even that’s negotiable. Spring- a time of emergence from the grim winter, thickened and pale, not unlike a grub– but one who wears clothes and complains about Daylight Savings Time. Summer. Utter joy! I run! I tan! I fish! I leap about, all while becoming the human I was always meant to be, but with a glistening coat of sweat at all times. Fall. the magic of autumn, in which I begin to pupate as my conversion into a Basic White Girl takes hold. Coffee! Pumpkins! Holidays! Turkey and pie and shame! Mild existential dread at knowing that after Christmas, life is over! Winter. Pre-Pre-Christmas! Pre-Christmas! CHRISTMAS! Moderate depression after Christmas. The letdown of New Year’s Eve, following by the horror of sunset at 4:30 PM. My body begins to spin a cocoon of fat, even as the tan fades from my skin. I think what the sun used to look like, and sigh. So, that’s where I’m at. Post-Winter Diet: check. Moderate anger: check. I feel like there’s a lot of broccoli in my future, and it makes me sad. Christmas, Fried Chicken, and Michigan. I’ve added an event in the heretofore unknown to me town of Frankenmuth, Michigan, which appears to be the geographical equivalent of my spirit animal. The “Best Fried Chicken Dinner in the World”. Okay, let’s stop there for a moment as I tell the good people of Frankenmuth that I will most certainly put that claim to the test. SO. I’m coming for you, Frankenmuth. I will have an empty belly, a stack of books, and an intense curiosity in sampling all of your wonderful fare. If you’re familiar with Frankenmuth and have suggestions for me, I’ll be there from August 10-12 of this year. Drop by, say hello, or suggest the things that I simply shouldn’t miss. I’ll have a minimum of two new books with me, and plenty of swag for readers. I’ll bring the books, Frankenmuth, you bring the chicken. It’s a date. Paging Clark Griswold: It’s Christmas time. I’ve reached a compromise with my wife. I wanted 250,000 Christmas lights, a small nuclear reactor to power the system, and live reindeer. She wanted light-up Christmas trees that have a vaguely Dr. Seuss-like quality; whimsical and fun. I like them. As you may have guessed, that isn’t 250,000 lights, but it’ll do. It turns out that an unlicensed nuclear plant is both expensive and frowned upon, so I’ll hold off until later and/or whenever portable nukes become a thing. Our search for trees was critical, as we have more than one Christmas tree in the house. Since we have somewhere between one and three hundred cats (I think), we have little trees placed high in *relatively* safe areas. Meet one of our little trees. That’s tucked away in my son’s room, and yes– that’s a VCR. He likes old technology, and he’s convinced that he can reinvent the American obsession with videotapes. Since he’s eight, I won’t call him a hipster, just an optimist. We found the trees at a local lot. It was dusk, and cool, and the perfect night for tree hunting. All in all, it’s been an amazing December and we’re just getting warmed up. Wherever you are, may this season be warm and bright. Our Jewish neighbor Ricky Blumberg (he was 20 years older than me, and a nice guy) came over on Christmas eve and said, “Can you ask Santa to get his reindeer off of our roof? They’re kind of loud.” This was 1974. I was six. I operated under the assumption that every Jewish male was a Rabbi. Rabbis do not lie. Ergo, this was all the proof I needed. I became a Santa Lifer. I’ve forgiven Hiroshi for his wanton cultural insensitivity ( I heard he went on to enjoy golf. I hope his game is horrible, but I’m not bitter). Regardless, that effectively ended my holdout on believing in Santa– at least in one sense. I still believe in the power of Santa as a binder for our family joy, over and above any religious connotations that Christmas brings. It’s a win/win– I have a holiday that involves church, food, family, gifts, travel, film, cartoons, beverages, legend, memory, nostalgia, and happiness. For me, that’s about as much as I can fit into one season. Hope yours is the same. Until January, when things really start happening for me, see you! The Expanse, Outlander Casting News, and Christmas. 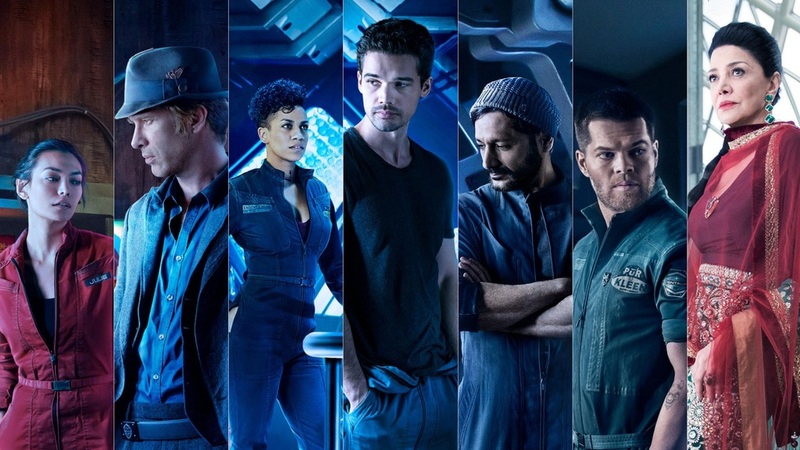 Last night was the kickoff episode of SyFy’s Big Grownup Show In Space, The Expanse. A little background: it’s a series of novels written by Daniel Abraham and Ty Franck (Under the pen name James S.A. Corey). It’s relatively near future space opera that highlights some immutable truths: humans will still find ways to screw each other regardless of where we’re living, be it Earth, the moons of Jupiter, or a barren space station in between. The novels are good, and were clearly workshopped with script uses in mind. Sometimes that’s a detraction from the quality of the story, but not here. Highlights of the first episode include Thomas Jane as a space cop with a skrillex haircut (apparently, that’s still a thing) and Steven Strait as Jim Holden. A note about Steven: the guy grew up. At some point between the iffy 10000 BC and now, he became a lot more legitimate as a leading man. An other point in his favor (or perhaps the director’s) is that he speaks slowly enough to indicate the deliberate, honorable pitch of his character. Holden, who goes on to form a familial bond with three other characters (all of whom are well cast) is going to be noting less than a galactic lynchpin of honor and action. So to the producers, well done. It should also be noted that because the authors massaged their narrative into a grittier reality of who would be in space, there don’t seem to be any throwaways among the cast. Even the drug addled Belter girl in one critical scene caries her weight easily. Belters are lanky, half-starved looking victims of low gravity life– their political actions become obvious later– who act as a sad reminder that even under the control of the UN, earth is more than willing to screw people in the name of profit. It pleased me to see that a unified, idealistic future would have the human elements of rapacity and violence. The Belters and their political wing, the OPA, are set up as an excellent foil for the story arc, as is the avaricious, dangerous leader of earth, Chrisjen Avasarala, who proves that even grandmothers can be horrible people. I think that Gia, seen below, will be a rare example of adding something to the mix with minor characters. Let’s face it, space is empty but The Expanse is crowded with an array of humans who all have their own agendas. It makes for a great possibility. The next episode (tonight) will prove if the producers are connecting with the material. As far as casting goes, it appears to be spot on. If they can resist the need to sanitize what should be an absolute mess of a universe, then this series has a chance. If they fall prey to the need for a narrative that “fits” within some mythological parameter, then we’ll endure another Dresden Files in which something beautiful was turned into, well, the Dresden Files. So, about Outlander. Roger Watch has ended! In case you were drugged and sleeping yesterday, meet Rik Rankin, who will be Roger MacKenzie, a.k.a. The Thrush. Kudos to the team who said, “Let’s get someone who looks like Roger, but sings as well.” The guy can sing. Here’s something I found that demonstrates to all of Outlander fandom that the right actor is in the right place. Well done! Richard looks like Roger, to me. I think it’s a home run addition to what is proving to be one of those casts that people will talk about for fifty years. Take that, y’all. Now– and I say this as a fan– if they screw up the selection of Bree, there will be nothing short of riots in the streets. Seriously. I haven’t seen this kind of pressure on a production staff in some time. Let’s see what happens before we march, eh? I’ll be busy with Christmas and family fun for the next ten days, I hope that your holiday is warm and bright. It’s been a wonderful year, and thanks for all of the emails, moderate threats, occasional compliments, and fun. New book will be out in late January, along with a new audiobook or two. It’s going to be a great 2016. I’ll have some signed paperbacks as New Year’s Gifts– stop by at the next post to get in on the giveaway. © 2019 The Official Website of Terry Maggert. All rights reserved.